Back in London, a quick googling revealed that the app was indeed the most popular Fintech app in Sweden with 52% of the Swedish population using it in 2015 and recently reached 5m users. What is this app about? Why is it so popular? Why don’t we have it outside of Sweden? A transfer is instant and free of charge. 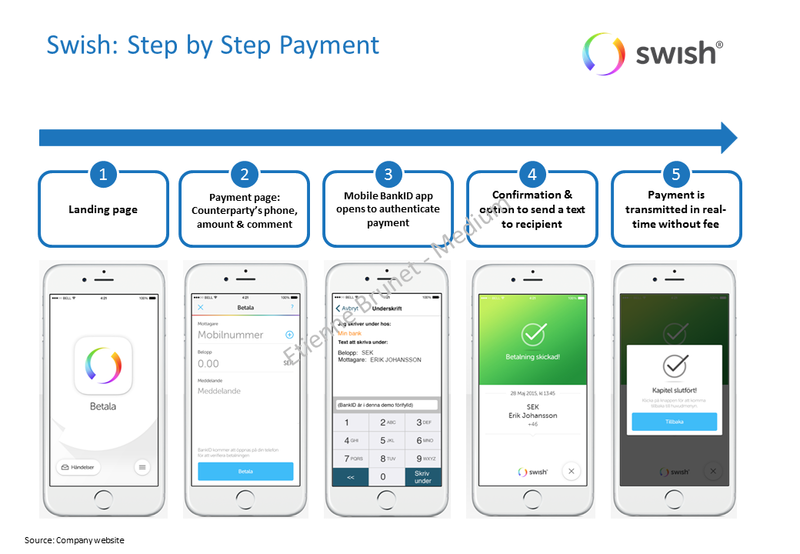 To use the service, one needs a smartphone, the safety solution mobile Bank ID, a Swedish bank account and the Swish app. A user only needs someone else phone number to transfer money. Has never raised VC funding and was created by a consortium of Nordic financial institutions: SEB, Danske Bank, Handelsbanken, Länsförsäkringar Bank, Nordea, Swedbank and Sparbankerna. “Has never raised VC funding and was created by a consortium of Nordic financial institutions”: This is probably one of the most interesting feature. It may be the only example in Fintech of a successful consumer product built by a consortium of financial institutions without having a VC-backed third party coordinating the relationship. 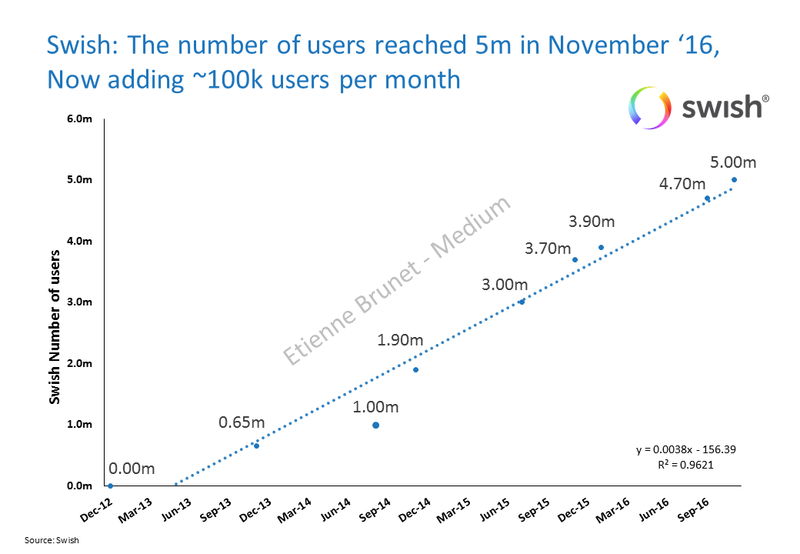 The insane user growth reaching in less than four years 5m of users (See above graph) or equivalent to 50%+ of the Swedish population is astonishing. Compete with cash & debit card: With an average transfer limit of c. $2,200 Swish is a perfect replacement of cash. No one seems to miss having to withdraw cash or to carry bills and coins (Who does not have a jar full of coins and always think they will go one day to the coin machine to exchange it but never does?). Privacy issue? : Today, Swedish banks have more Swish transactions than A.T.M. withdrawals. 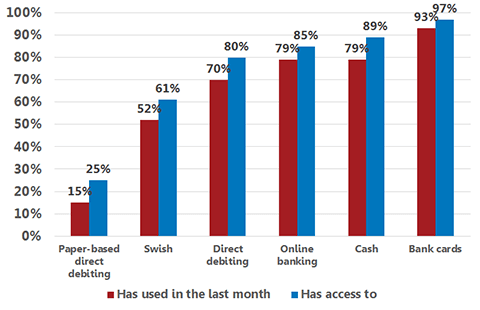 Swedish banks have now more and more data on their users transaction habits. Some may argue that this may lead to privacy issues. Do you want that your bank knows every transactions that you have done? I guess not. In a recent Wired article, Björn Ulvaeus (Former ABBA) shared his view on why a cashless society will help to fight criminals: “ Take it away and thieves have no foolproof way to sell their stolen goods, drug dealers no way to hide their deals, and eventually the whole shadow economy collapses.” However, one may argue that thugs may switch to Bitcoin or other crypto currencies for their trades. 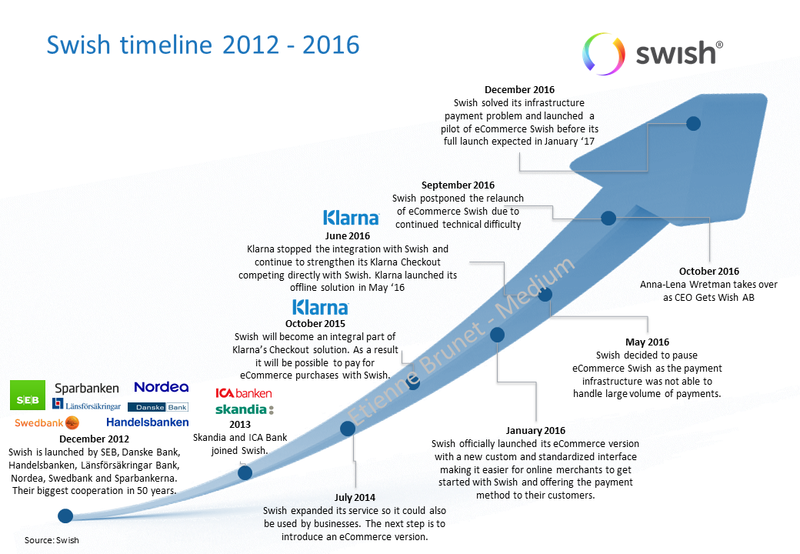 Swish has been moving into the B2C market, challenging Swedish unicorns like Klarna, Izettle. At its inception, Swish was primarily used for transfers between two persons who wanted to split the bill or for paying back debt in everyday life. Quite quickly, small businesses started using the app as it was convenient to use and free of charge. In July 2014, Swish expanded its coverage to businesses. For companies, the app costs between 1.5 and 2 SEK ($0.16–0.22) per transaction and is a direct competitor to iZettle. Compared to Swish, retailers with iZettle need to have a small card reader in order to accept payments, while this isn’t necessary for Swish. Moreover, iZettle has transaction costs unlike Swish. At first Klarna was a partner with a partnership announced in October 2015. But the partnership terminated in June 2016, when Klarna entered the offline transaction market with its Checkout solution. After conquering the Consumer to Consumer transaction market, Swish has now been working to expand to eCommerce. After a launch in January 2016, the Company had to pause its eCommerce solution due to technical difficulty with BankGirot/BankID. After working for 8+ months on it, Swish is expected to relaunch its eCommerce app in January ’17. This will be a very exciting next step for the company. My first thought after learning more about Swish was when can I use it in the UK or in France? Swish’s internationalisation is very complicated for a few reasons. Swish was built within a single country with a unified and trusted payment infrastructure (BankID) and a single currency (SEK). Moreover, cash has seen its usage decrease over the years in Sweden. In addition, Swedish financial institutions had experience working together though not a this scale of success. All these elements helped the success of Swish including others such as the very high mobile penetration. However, even with these elements, the IT infrastructure was not ready to move from C2C to B2C. After a 8+ months of revamp the platform will be relaunched in January ‘17. Swish competitors start to emerge. For instance, in March 2016 clearXchange was launched in the US, a bank-backed service that lets people transfer money from their bank account directly into someone else’s. Unlike Swish, payments are not instant and take usually 24h and only work with participating banks. This is a great initiative though a company like Vemno, who enjoys a very strong market share in the US, may be a strong competitor. As well as other factors the high level of cash usage in the US, representing 50%+ of all transactions, may impede the switch to clearXchange. Next time I go to Stockholm, no more SEK only Swish. I like decentralisation and capital markets.